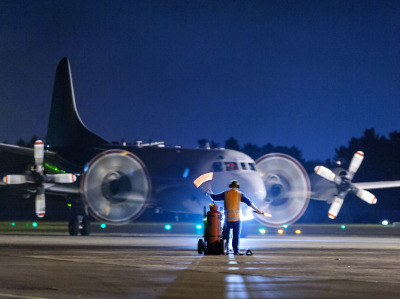 5 Squadron P-3K2 Orion NZ4205 conducts a night flight from RNZAF Base Auckland, 30 September 2013. The Orion is guided in to parking bay on the flight line a after landing. The continued success of the EU naval operation off the Horn of Africa to ensure safe passage for vessels carrying much-needed food and stop piracy is due to the combined efforts of airborne and maritime elements. Operation Atalanta last year marked its 10th anniversary and the task force used fixed and rotary-wing aircraft are force multipliers the whole time. All 10 years of the operation have seen a continual presence of maritime patrol and reconnaissance aircraft (MPRA) deployed to Djibouti, Kenya (Mombasa) and the Seychelles (Victoria). Aircraft have been provided by France, Germany, Luxembourg and Spain and helped to create a broader maritime intelligence picture. When used effectively the aircraft have captured crucial imagery and influenced the behaviour of suspect vessels. The EU NavFor MPRA detachments work closely with other Atalanta partners, including the Japanese MPRA detachment in Djibouti. The main mission of EU NavFor’s MPRA is to fly over operational areas, detect suspicious vessels and behaviours and guide warships to positions as well as collect intelligence/imagery on specific areas and activities. This was demonstrated following an attack on the merchant vessel KSL Sydney when an EU NavFor maritime aircraft spotted and tracked a suspected pirate vessel that was later seized and destroyed. “These crews are a crucial component in keeping shipping safe from the threat of piracy and allowing the free flow of international commerce,” according to an EU NavFor statement. Helicopters are acknowledged as versatile components in the force commander’s armoury, providing a deterrent, disruption and surveillance capability. Rotary-winged aircraft can also move people and supplies quickly and effectively, between ships or into remote and inaccessible areas. Fourteen EU member states have provided warships to EU NavFor since 2008, as have partner nations including Norway, Ukraine and Korea and Colombia, so a range of helicopter types have been embarked.